The Night club in the SKY !!! 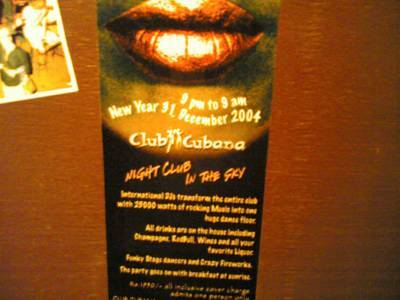 Club Cubana , perhaps undoubtedly the No.1 club in Goa and India . I went to this club on 26th Dec night and wished to never come back again. This club is a MUST VISIT when you come to GOA . The club is on a hill and overlooks the valleys and beaches of North Goa . Its blue laser light filles the valley and creates a magical effect. The club has 3 seperate areas and many enclosures for privacy. It balances lounging , dancing and drinking. I love their punch line : NIGHT CLUB IN THE SKY. I have added my own twist to it and call it : DANCING IN THE SKIES :-) I have also made a full 2 hour video of the party that night and it features some amazing tracks played by the DJ. I also met some big wig of the Indian corporate world and they were letting their hair down too and having a wild nite. Some pics to follow enjoy. !! !